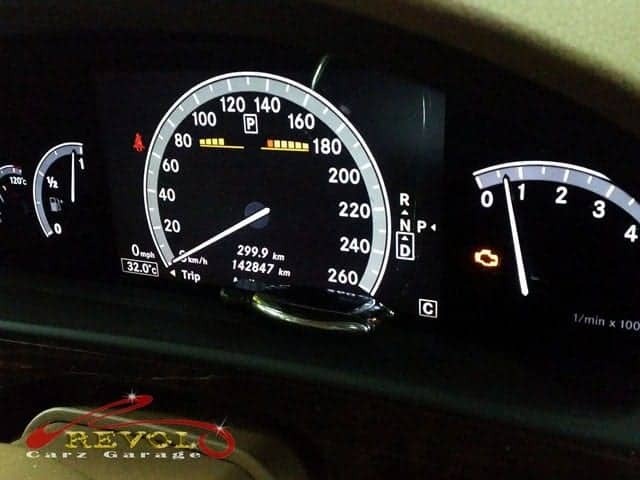 Every time a warning icon lights up on your dial when the engine is on, it tells you that something isn’t right in your automobile and needs immediate attention. Some of the warnings are minor issues and could be resolved quickly (for example, door(s) not shut properly). However, when major issues are detected, it is safer not to drive. 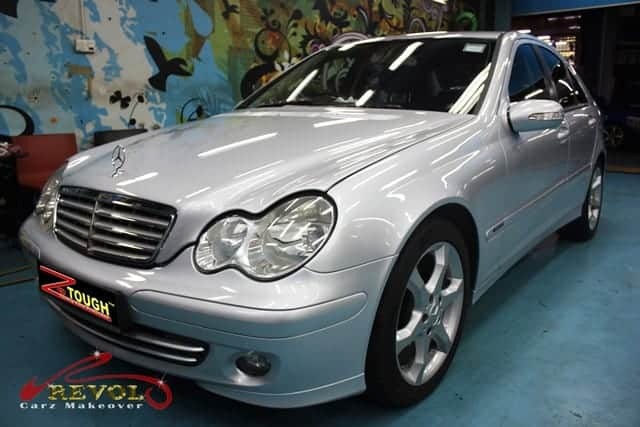 A Mercedes Benz S300 was in such distress. The transmission gears were unable to engage and the car had to be towed to our workshop. Following our skillful diagnosis, we promptly pin-pointed the fault to the gear-box. In normal circumstances, the same fault codes in a similar engine checks by others may merit replacement of a complete set of valve-body. However, our experienced technicians knew it was only the electronic transmission control that was faulty. We replaced it and resolved the gear issue. The transmission gears could now be engaged – smoothly! We felt a sense of satisfaction to see the delight in our customer’s face. 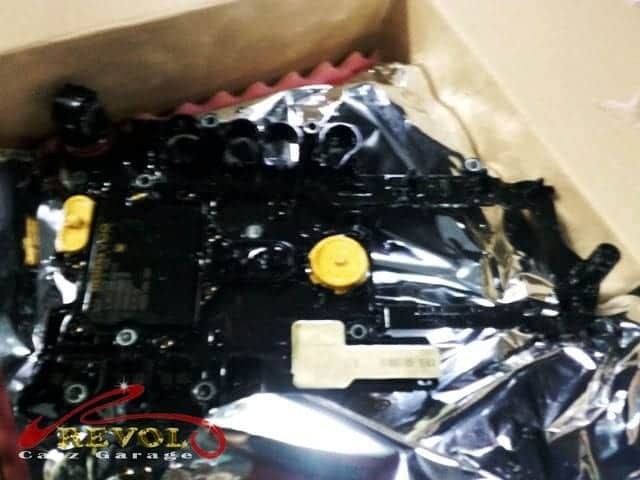 He was grateful that we had not only swiftly solved his gear problem but we also saved him substantial sum of money had he been advised to replace the whole set of valve body. Letting a workshop with integrity (especially with your best interest at heart), to repair your car is an important consideration. 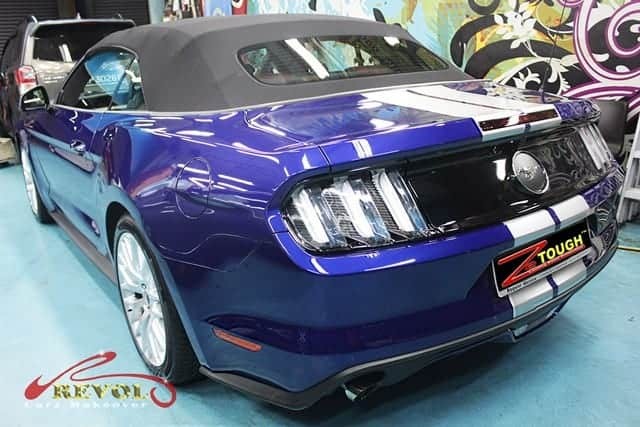 The imposing looks of the new Ford Mustang Convertible stirred up the air as it angrily vroomed its way through the busy industrial corridors, heading towards Revol Carz Makeover workshop for a makeover treat with our renowned ZeTough Ceramic Paint Protection Coating. Inevitably heads turned as curious neighbors stepped out to awe at the angry-looking convertible Ford Mustang. There was certainly something special about this chiseled Pony Coupe that drew this much attention. From a distance, the new Ford Mustang Convertible stands out with its striking looks and wearing the recognizable Mustang emblem. 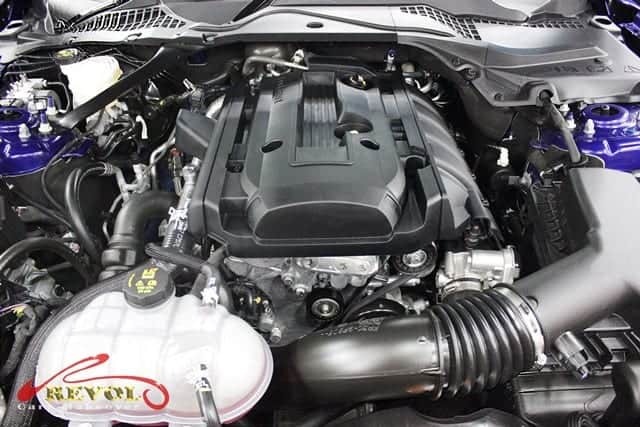 This turbo-charged four-cylinder 2.3-litre EcoBoost model with six-speed automatic transmission packs plenty of punch – 233kW and 432Nm of torque that result in more than adequate acceleration. The sprint from 0-100km/h takes just 5.8seconds and a top speed hits the electronic limiter at 234km/h. The interior is quite well-styled which carries strong cues over from its preceding models. 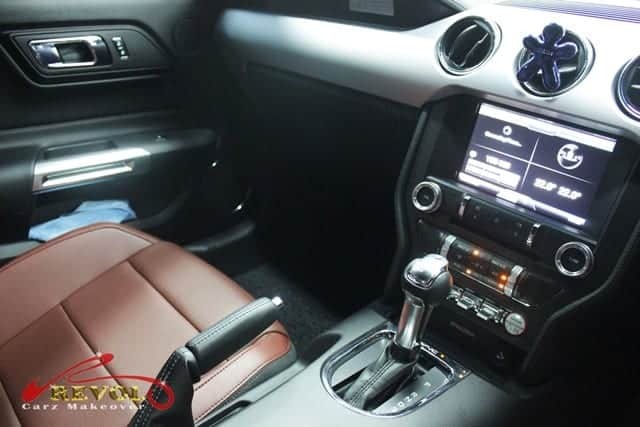 It gets cool leather seats, classic Mustang twin-cowled dashboard, a trio of circular air vents, new Sync 3 infotainment system with Apple Car-Play and Android Auto, 8-inch touch-screen, Sat Nav and reverse camera as standards. With a wide band of metal trim running the length of the soft-to-the-touch dashboard, the interior feels very comfortable and well built. A picture is worth a thousand words! 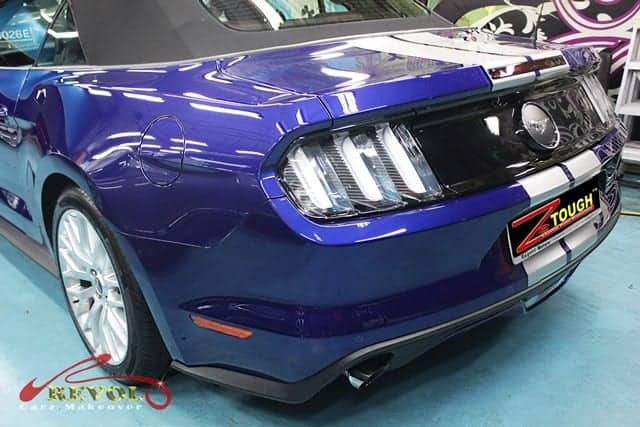 See to believe the magic of ZeTough Ceramic Paint Protection Coating that glorifies the Ford Mustang with that incredible long lasting showroom shine. 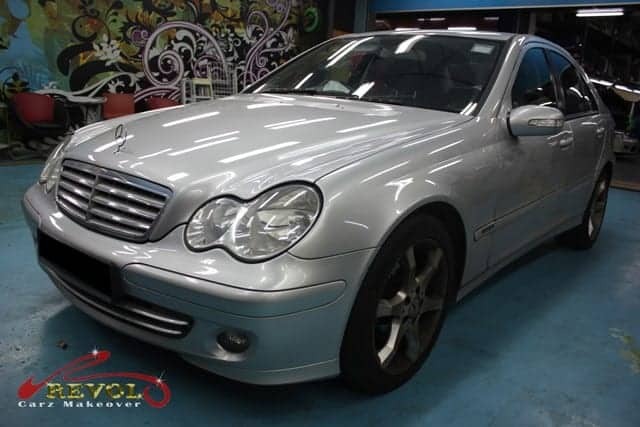 Angry headlights, recessed grille,…that long bonnet, those flanks…all consistently polished. 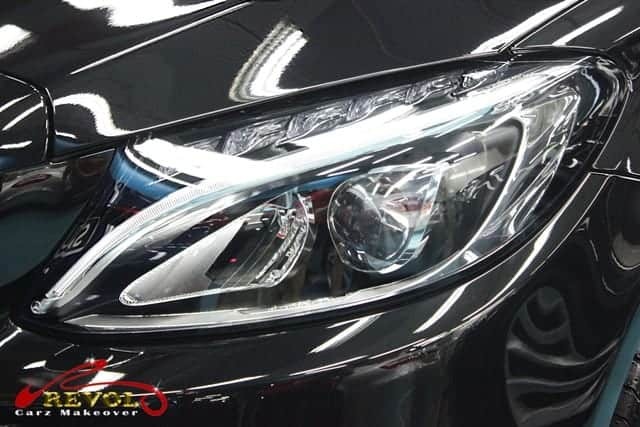 The incredible gleam says a lot about the Midas’ touch of ZeTough Ceramic Paint Protection coating. 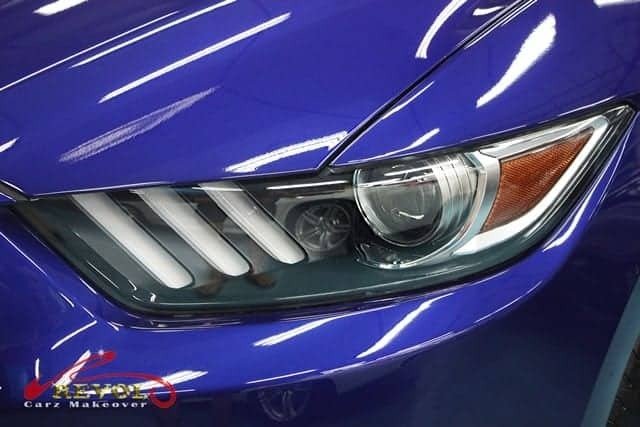 The angry looking Mustang’s headlights with three vertical bars are more menacing after passionately polished manually. One of the highlights of Revol Makeover is a perfectly cleaned and polished engine bay. The 2.3-litre Ecoboost, four-cylinder turbocharged petrol engine lurks under that long bonnet. 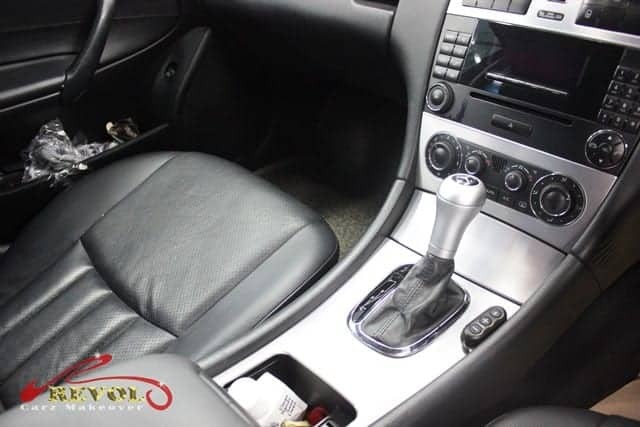 Giving the customer the fullest satisfaction of a clean, sanitized interior with the leathers treated and nourished is motivating for our professional detailing. 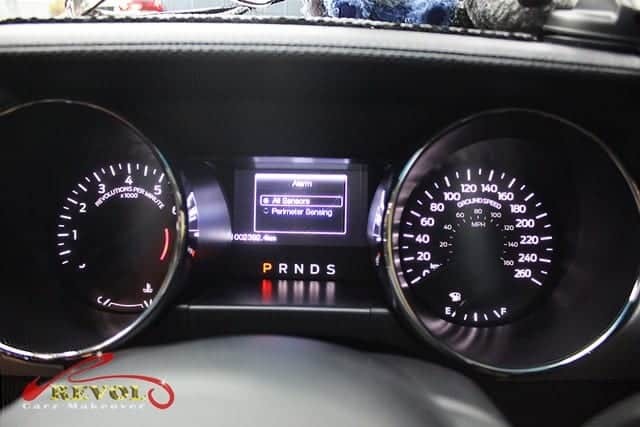 The cleaned and polished Satin Chrome Instrument cluster gives the driver greater pleasure to drive. 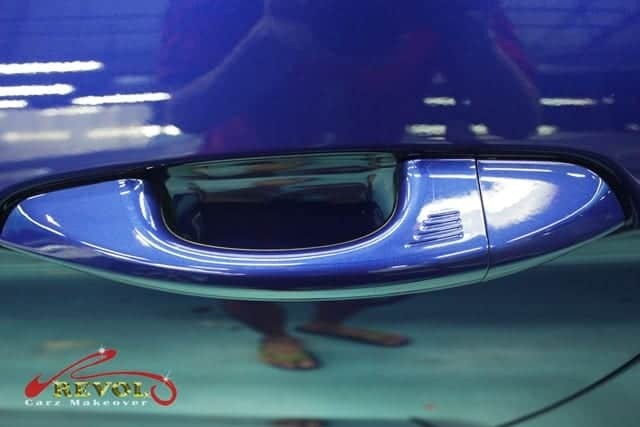 The body-color wing mirror housing radiates a perfect reflection after the coating of ZeTough Ceramic Paint Protection is fully cured. Unwelcomed rings and finger-nails scratches on the door handles are common and a pain to the car owner. 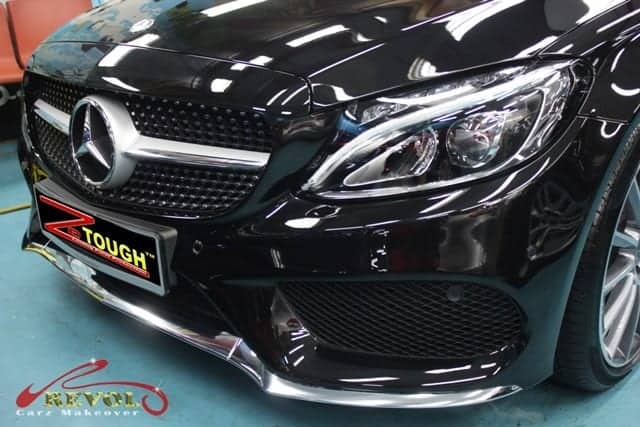 The diamond-hard coating of ZeTough Ceramic Paint Protection saves the day. The rear view of the Mustang Convertible is just as striking as the front after the ZeTough Ceramic Paint Protection coating. The boot isn’t that generous but still a good size for a convertible. 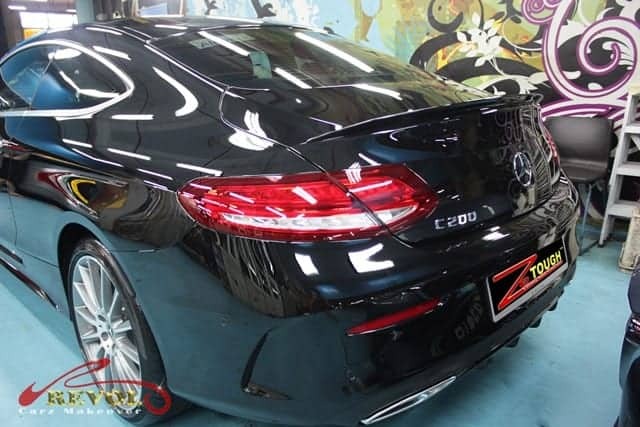 The eye-catching rear with the three-bar-vertical tail lights have been vigorously polished and treated with ZeTough Ceramic Paint Protection Coating to achieve a long-lasting, showroom shine. We pay close attention to every little detail. 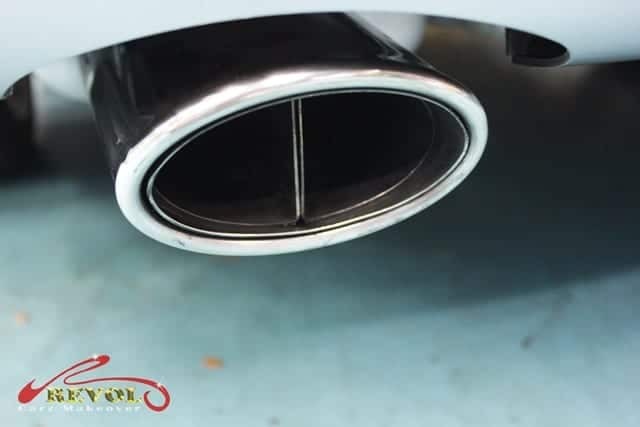 The Dual Bright exhausts with rolled polished tips are polished to new-look condition. The 18-inch Magnetic Gloss Painted Machined Aluminum Wheels are cleaned, restored and polished. Ugly kerb-rashes are all eliminated. 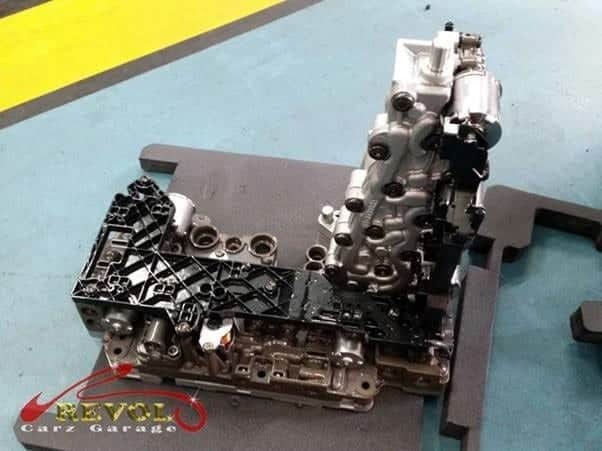 Before we share another blog about a gearbox that was recently overhauled by our specialists at Revol Carz Garage, we would like to share with you some useful tips on maintain your gearbox to its pristine condition. • Always perform regular checks for leakage of auto transmission oil from oil pan. • Maintain the required transmission oil level in the gearbox. Without sufficient transmission oil level might create overheating. • Replace the auto transmission oil regularly according to the recommendations in the car maintenance manual. 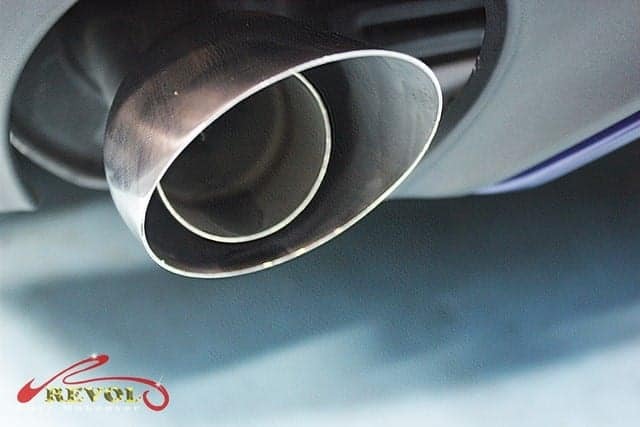 Although some transmission oil manufacturers may claim that their transmission oil can lasts the car’s life time, the oil lose its viscosity over time resulting in overheating. There is always a shelf life span for oil. 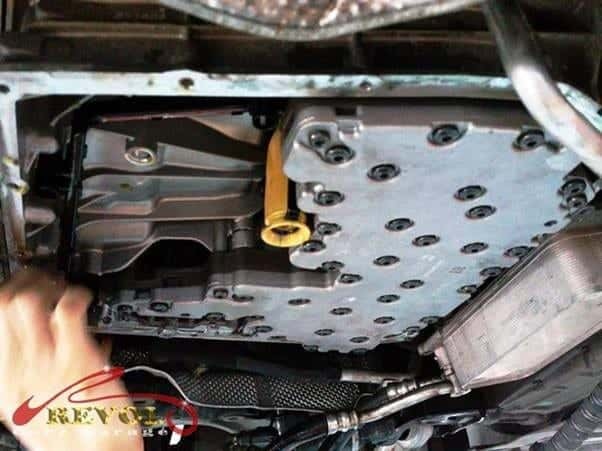 We strongly believe that following the above maintenance recommendations could not only prolong the lifespan of your auto transmission, and also maintain its efficiency. 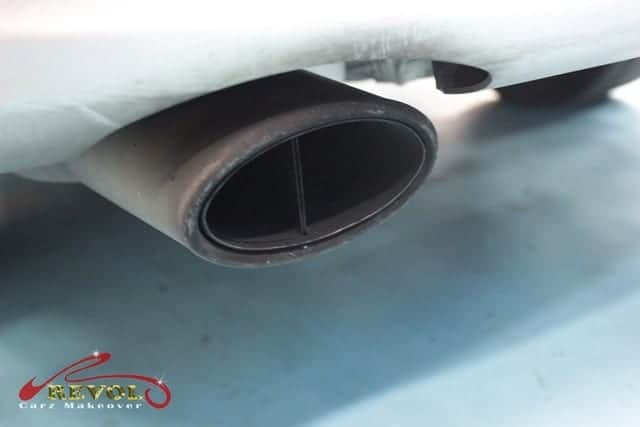 If you notice something unusual on your car, feel free to contact us for a no obligation check and assistance for early breakdown prevention. It is wise to know that many major and expensive repairs can be avoided if the vehicle is properly maintained and checked regularly. 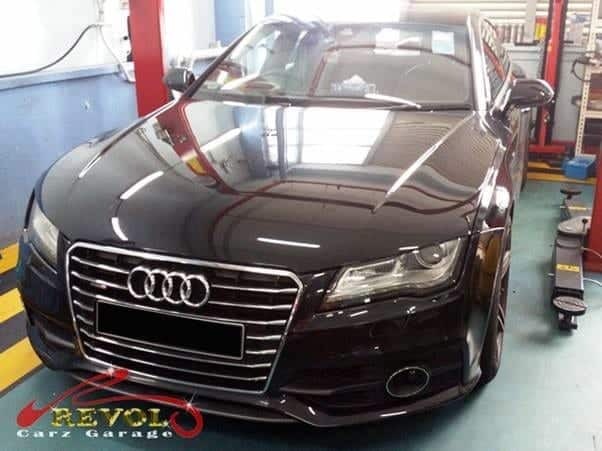 Today we have another Audi A7 who is facing gear engagement issue and entrusted his beloved car to us for the diagnostic. 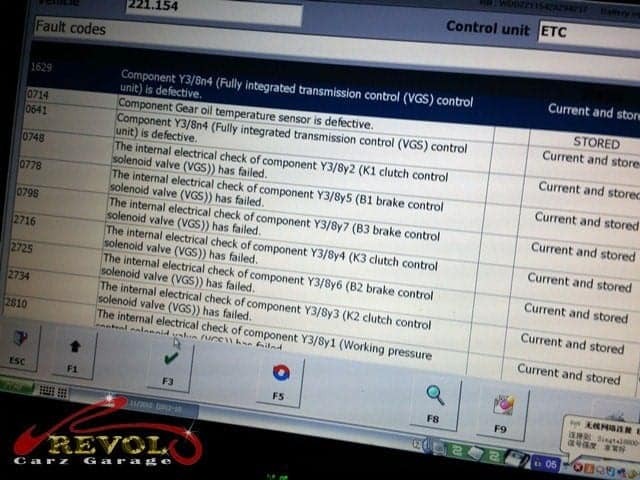 Our professional technician confirmed the issue lies with the mechatronic – Gear control unit and work begin swiftly. This is the Audi A7 mechatronic and I would say it is one of the most beautifully designed mechatronic in the Audi series. The mechatronic is professionally fitted in. 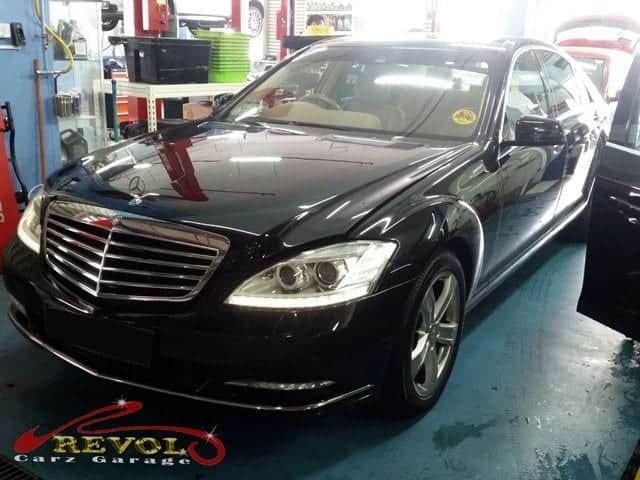 We are glad to be able to return the beauty back for her to be back on the road confidently. 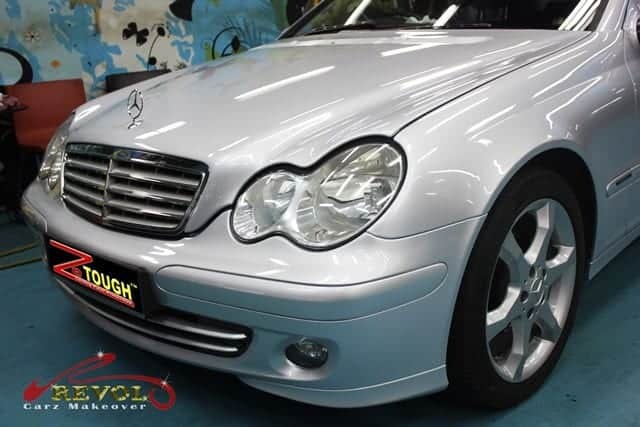 A Mercedes AMG C200 Coupe indulged in a ZeTough Ceramic Paint Protection coating at Revol Carz Makeover and we are excited to post some pictures showing the remarkable transformation for your discovery and viewing pleasure. The Mercedes AMG Coupe combines sinuous lines and elegant shape; longer bonnet than its predecessor, frameless doors and a longer wheelbase for a better ride and more legroom. Characteristic coupe touches include frameless doors and a steep dropping line at the rear. Striking elements including a snarling front featuring large air intakes and signature diamond 3D effect grille add to the AMG experience. With exceptional dynamics, the sporty and agile Mercedes AMG Coupe delivers the kind of performance that leaves you breathless.The powerful 2.0-litre petrol engine with 181bhp or 241bhp can bring the acceleration from 0-100 km/h is only 7.3 seconds. The interior is just as much wow-factor as the exterior. Spiced up with plenty of metallic, piano-black and wood inserts, the clutter-free design looks sophisticated. 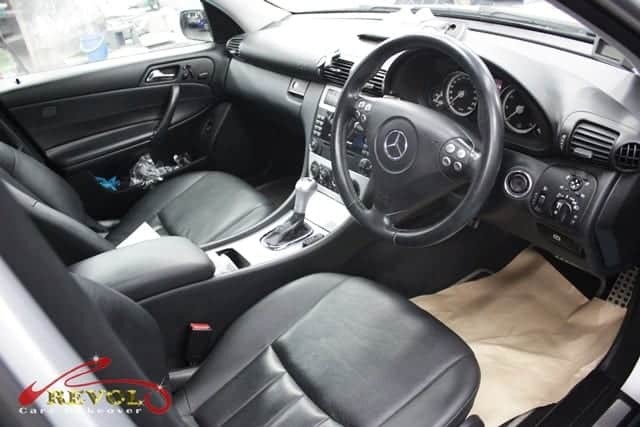 The standard integral AMG performance seats are upholstered in ARTICO leather for maximum comfort. Most functions are controlled via the infotainment system. 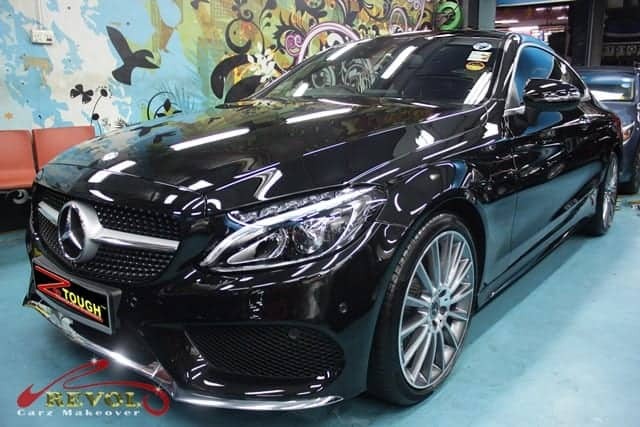 The Mercedes C200 AMG is transformed to a showroom splendor with the permanent coating of ZeTough Ceramic Paint Protection. In profile, dramatic shoulder and belt lines surge towards a powerful sculpted rear section that echoes the S-Class Coupé. 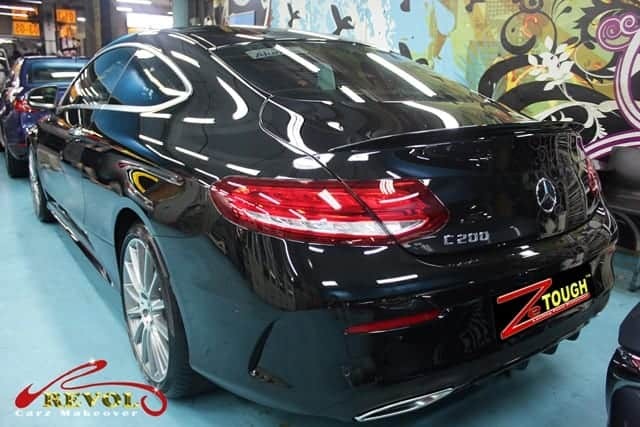 It is hard to give the slinky Mercedes Coupe a bigger compliment on its exterior that has been treated ZeTough Ceramic Paint Protection coating. 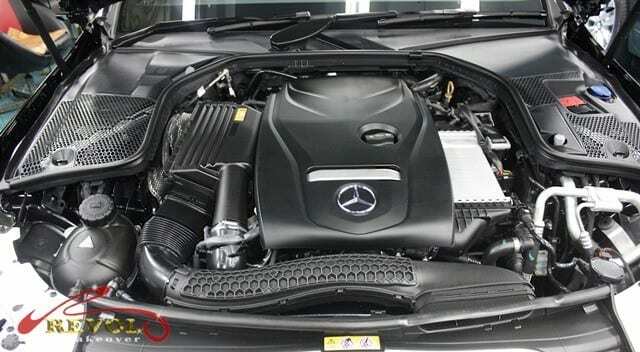 The ‘3D’ effect grille wearing the large prominent Star makes this an unmistakably Mercedes AMG. Detailing the engine bay is an enjoyable part of our job yet a huge challenge to achieve such satisfying results on the 2.0-litre petrol engine with 181bhp or 241bhp. The interior is a wow-factor after dedicated detailing at Revol. The standard integral AMG performance seats have been further nourished and sanitized by our enthusiastic team. The C-Class AMG Coupe gets a seven-inch color screen with rotary and touchpad control. It’s a thrill for the driver to sit behind the cleaned, futuristic instrument cluster that flanks the LCD screen. 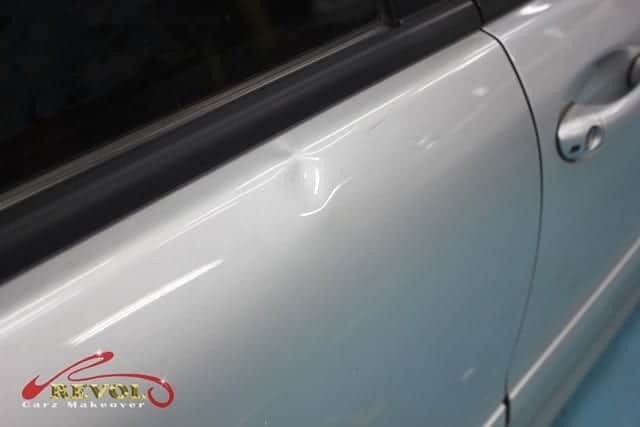 The finger-nail scratches on door handle recesses have been totally eliminated and are further protected with the tough coating of ZeTough Ceramic Paint Protection. 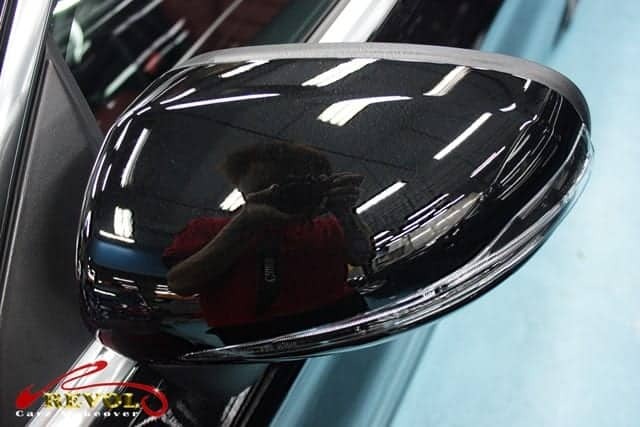 A close-up of the electric wing mirror shows the amazing deep-gloss and diamond-hard film of the long-lasting ZeTough Ceramic Paint Protection coating. OMG! The tail-lights sparkle brilliantly like huge polished red rubies. 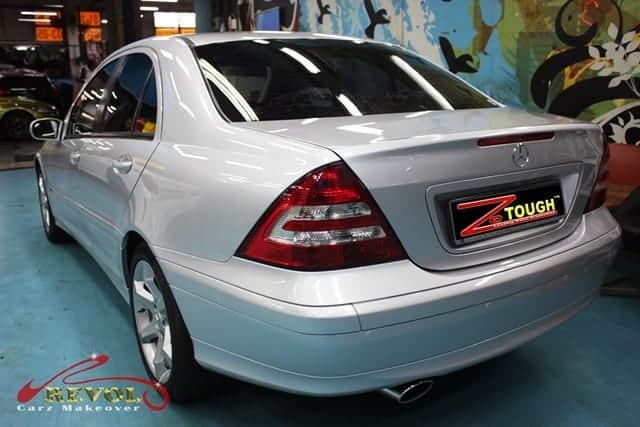 Beneath the gently arcing edge of the boot lid, a prominent Mercedes-Benz star is flanked by slender two-piece tail lights that emphasize the vehicle’s width and enhance its on-road presence. Last but not the least, the exhaust tail-pipes get careful polishing and are totally renewed. 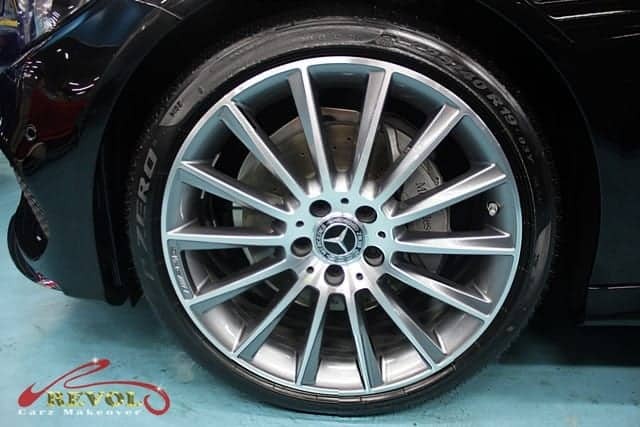 The AMG Line version aggressive 18-inch AMG alloy wheels are fully restored to like-new condition. No more ugly kerb-rashes, scratches and they are dust free.